This is a great mixture of foliage and colour. What are all the shrubs you have here? 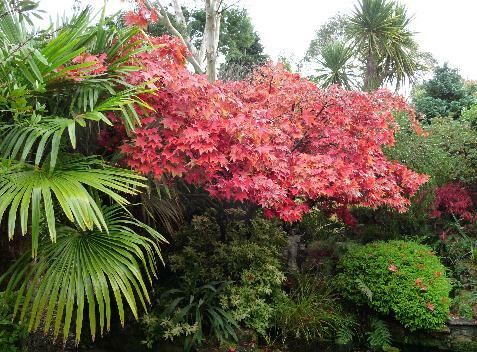 Left to right: Trachycarpus fortunei, Acer palmatum heptabolum ‘Ozakazuki’, Acer dissectum atropurpureum and Pieris ‘Forest Flame’ centre bottom. I always ask about pests. What are your worst? And how do you deal with them? The worst ‘pests’ can be local cats and dogs. Dogs leave their mark on the drive and lawn area and can also cause physical damage to shrubs and hedges. I very seldom use chemicals in the garden. Insects don’t seem to cause too much damage. Vine weevil in pots can be an issue as the grubs eat the roots. We have frogs in the pond. Have yet to see any newts. Saw a lizard, once, 20 years ago! Saw a fox in the back garden once, they probably pass by more regularly but unseen. Herons are regular visitors (for the fish in the pond). Lots of birds visit and we have a resident robin. Magpies have taken over recently, scaring off other birds and chipping off bits of mortar from the roof ridge! And any tips for making your own compost? I don’t go too much by the rules, but rather go by the fact that all vegetation decomposes in time, so I let it do its own thing. Obviously it is quicker if you mix soft with hard (grass with hedge clippings / twigs etc) to help aerate and prevent stagnation. You’re quite high up here, is wind a problem? 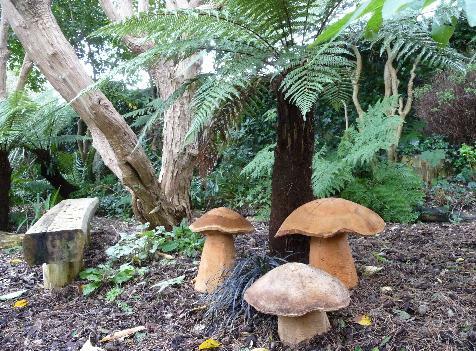 The garden is located at 500 feet (150 meters) close to the Howth summit. Fortunately we get good protection from our tall and deep hedges which surround the front and back garden. In very high winds plants have been twisted and upended from the ground. As I grow mainly shrubs and trees, I don’t have a great problem as I might with tall herbaceous plantings. How do you keep your pond so clear? My pond is a quagmire of green slime and I don’t know what to do with it. The bigger the pond, the more chance nature will help with the correct balancing. 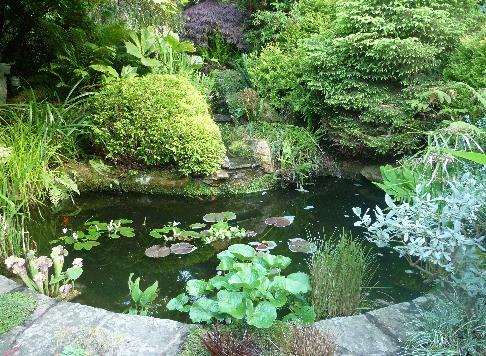 Ponds are a great focal point in a garden. We want our water to be clear and clean. The best way to do that is with benevolent neglect and keeping the pond balanced ecologically. Cover half the top of your pond with floating plants. When sun hits water, algae form. Keep the water half covered and half as much water will be in the sun. Use water lilies, water hyacinths and oxygenating plants. If you have too many fish, the fish waste will not be absorbed by your ecologically balanced pond and the water will turn green. One linear foot of fish per 25-square feet of pond surface is a good rule to follow. Know the pH of your water. If it gets on the basic side, algae grow and the water turns green. Usually this will fix itself if the pond is balanced. If it doesn’t after a couple of weeks, you can buy a commercial product to lower the Ph. Have you ever heard of aquaplankton for ponds and does it work? I don’t use it but I am sure it works if you follow instructions carefully and know the capacity of your pond. Did you ever have dragonflies/damselflies in your pond? I did on my first year and nothing since. Yes we do, but did not see as many last year. How long have you had this garden and what was here to start with? 20 plus years, I inherited a lawned area with high hedges all around and 12 very old and well shaped Leylandii conifers up both sides of the back garden. Is the soil acid/alkaline and what plants work best. Soil is shallow and free draining and on the acid side of neutral (pH 6.5 to 7). Rhodos and camellias do well as do many tender plants including palms and tree ferns. Is there a particular plant you couldn’t do without. 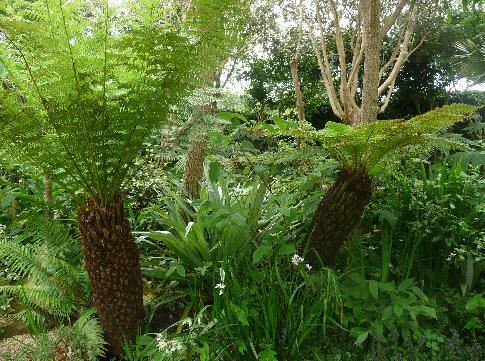 Many come to mind including Cordyline indivisa, Dicksonia Antarctica and Tracycarpus fortunei. 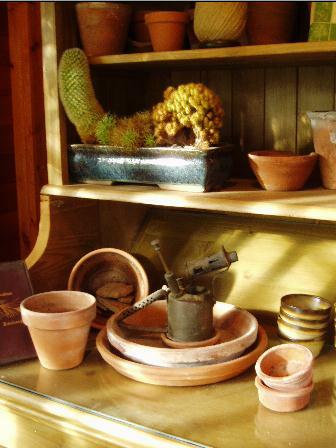 Have you any unusual tools in your shed that new gardeners might not recognise. As soil is shallow and stoney, a 6 foot wrecking bar, pick axe and mattock are very useful. Are there any problem areas in your garden and how do you deal with the issues? How many hours a week do you spend on maintenance, is it a high garden? I am a weekend gardener and can spend 20 hours there if I am seeking perfection or tidiness for an open day. Do you use chemicals and pesticides? I seldom use chemicals or feed plants. The plants may end up much less vigorous but they seem hardier for surviving harsh winters. I love your little terracotta pot man. Any ideas where I could buy one. I’ve been looking for years. Do you have a favourite celebrity gardener or do you just do your own thing? Both. I like Myles Challis and Diarmuid Gavin and, from the past, Robinsonian garden style after William Robinson (1890) the influential and brilliant Irish garden designer. Robinson believed in natural gardens, as opposed to the formal approach of those who preceded him. What is your favourite part of the garden and why? Japanese style area and tiny woodland area because they seem to work as part of the overall garden and, like everything in the garden, I designed, built and planted myself. But overall I like it all. Does your planting scheme evolve or did you design it from the start? What is your favourite gardening job? And is there anything that you absolutely will not do, no matter how much the garden needs it? I do not consider myself a ‘real’ gardener as I don’t, in general, grow things from seed or plant vegetables or fruit. I don’t particularly like the planting process as I tend to plant large specimens and it takes hours to dig just one hole deep enough. I much prefer hard landscaping, building structures, ponds etc. I don’t like or bother with lawn maintenance but appreciate how a well kept lawn can enhance the overall effect and set of the borders. I hope they invent a perfect imitation lawn carpet soon! I love this guy. 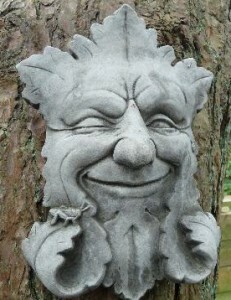 That’s what I like most about visiting people’s gardens, the quirky things they have hidden in the nooks and crannies. Does this guy have a name? No but you can give him one if you wish.